Janet Rogers, left, made a lasting impression on Edna Benjamin Pierre Louis. 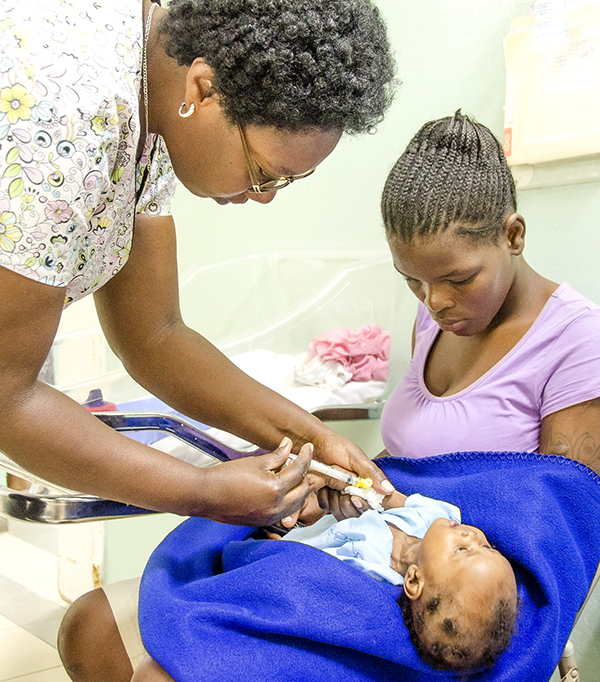 Edna Benjamin Pierre Louis is the director of nursing at St. Damien Pediatric Hospital in Haiti. Edna and 6 of her colleagues are spending 5 weeks training in their respective fields at Akron Children’s Hospital. In September, the Akron Children’s staff who works closely with them in Akron will travel to Haiti to complete the cycle and further their training and education at St. Damien. This program is supported through a grant from Rotary, which shares Akron Children’s vision of empowering our Haitian colleagues to care for the children of Haiti in a sustainable way. On Monday, May 23, I met an extraordinary woman. Janet Rogers is the director of critical care, emergency departments and specialty care units at Akron Children’s Hospital. Janet is leaving a huge impression on me, starting with the kindness she has shown me throughout my first week. She introduced me to several other managers and directors who were also very welcoming. I had the opportunity to attend several meetings with Janet. At the beginning, I didn’t understand how the hospital functioned but after only a short time, I understood so much more than when I started. I was happy to see how everyone works as a team here. Although there are many people involved, they function as a unified team and I was impressed to see how well everything is coordinated and planned. Janet further impressed me with the way she equitably handles conflict that arises in the workplace. She also never tires of my questions. I never ask questions during meetings, instead when I want to better understand something, I ask Janet about it after the meeting and she is always available to answer my questions. This week was a great week for me and I hope to continue to take advantage of every minute I spend with the great staff at Akron Children’s, especially Janet. Thank you Janet and thank you to everyone who has worked with Janet and I this week! I would also like to thank Dr. Jeff Kempf and Dr. Brittany Potts for allowing me to participate in this beautiful experience in nursing administration at Akron Children’s Hospital and to everyone else who helped develop this training program. I also cannot forget to thank the Rotarians from Ohio and Port au Prince. 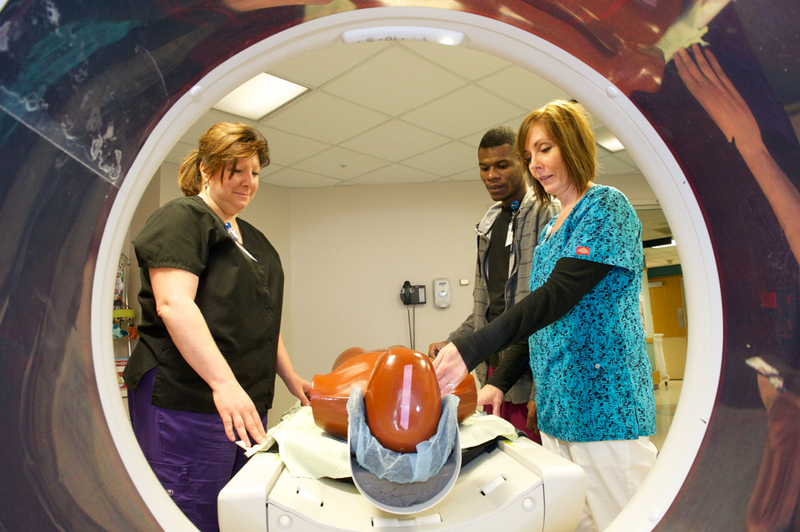 St. Damien Pediatric Hospital strives to heal every child that arrives for care. 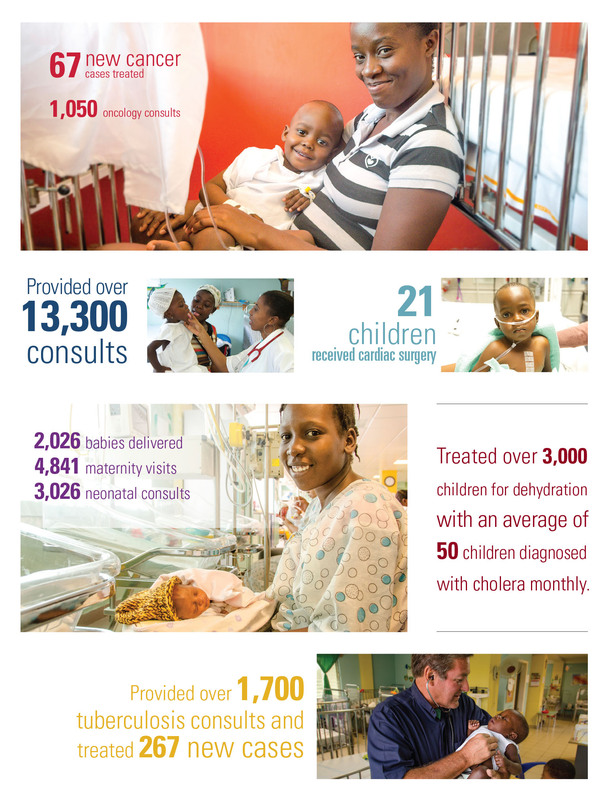 In 2015, we provided over 13,000 consults and over 3,400 children were admitted. Every day is “health day” at St. Damien. St. Damien is part of the NPH Family. At our NPH homes, over 600 children live with chronic health conditions. 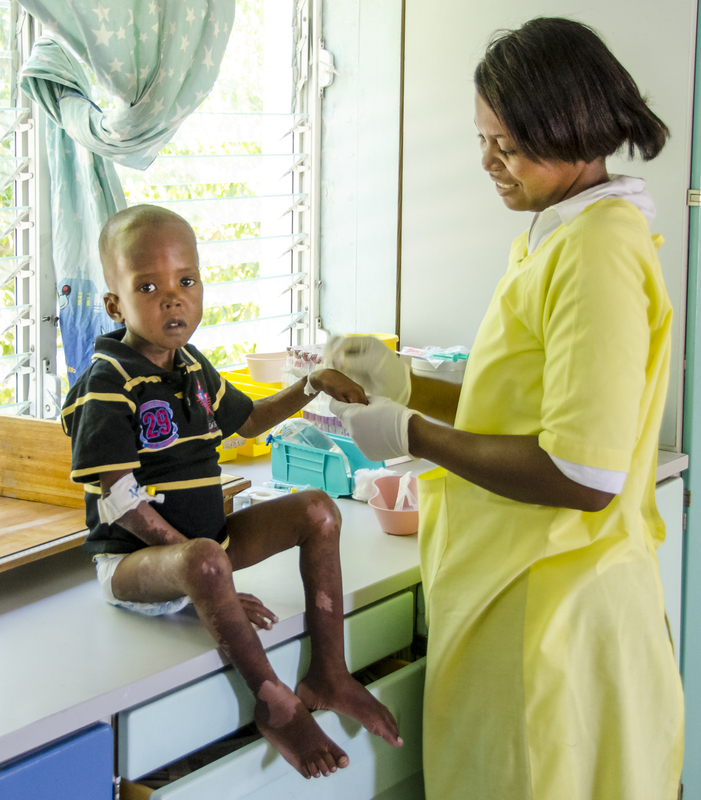 Whether it’s treatment for HIV or a life-saving surgery, our local and international medical services team of healthcare professionals provide our children with access to vital services. As part of this process, we support local healthcare staff and promote collaboration among our homes’ interdisciplinary teams to ensure each child receives the best physical and emotional care possible. “NPH goes to enormous lengths for children who have special and serious medical conditions and disabilities -enormous lengths to take care of them, even life-long.” Fr. Rick Frechette, CP, DO. 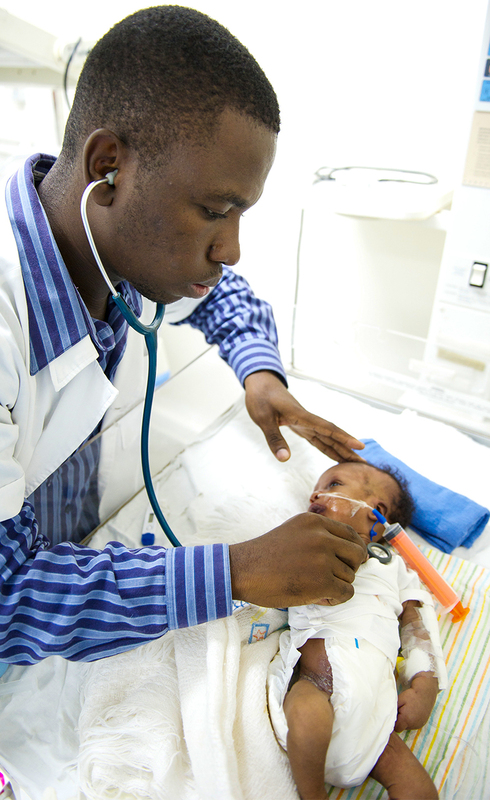 Eleven children received heart surgery at St. Damien Pediatric Hospital during the week of Feb 21-28th. Led by Gift of Life International, Rotary clubs in Haiti, Akron’s Children Hospital, Haiti Cardiac Alliance and Open Heart Haiti, together this wonderful partnership is able to help Haitian children with heart disease. Our goal is that this program will intensify as Haitian staff are trained to provide care for children in their own country. This is an extraordinary opportunity for St. Damien Hospital to partner with other nongovernmental organizations to continue the mission of providing medical care for children who are the most vulnerable. This was the third mission that St. Damien has hosted and in total 32 children have received surgery during the past 1.5 years at our facilities. 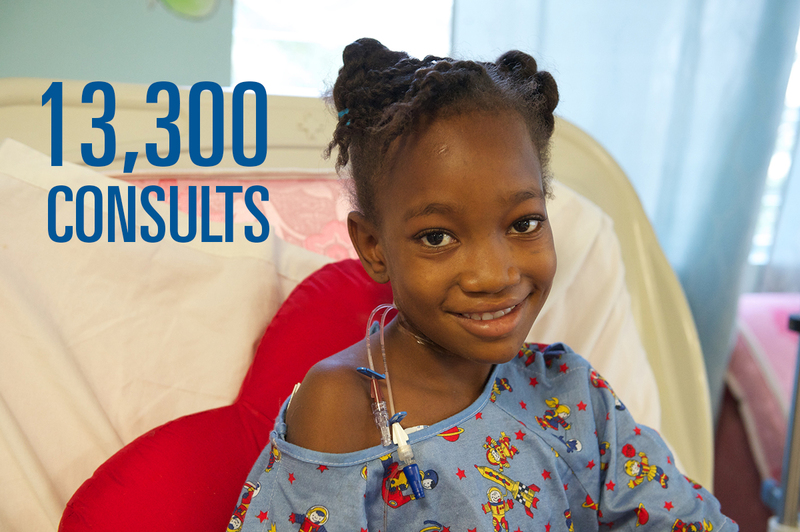 We have a great need for this specialized surgery in Haiti, as over 1,000 children are struggling with heart disease. I wish to share with you all the beautiful story of Lucien*. It was Saturday, September 12th, the day of the Holy name of Mary, and Father Rick Frechette and I weaved through crowed streets on the backs of motorcycles in route to help run a clinic at St. Joseph’s with the Missionaries of Charity, also known as the Sisters of Mother Theresa. As we neared the church in Croix des Bossales, we came upon a bustling marketplace, full of people selling and trading. The crowd was so thick it blocked our way. It seemed like there was not an inch of space; a pin thrown into the air would surly have struck a pedestrian and not the ground. This same marketplace dates back to France’s rule in Haiti and was once a slave trading outpost. We gathered our courage and plunged into the crowd on foot elbowing and nudging our way to the gates of St. Joseph’s. We went from the crowded streets to a crowed courtyard as the church’s exterior was lined with the sick and destitute. I was amazed at their numbers and baffled at how they managed to part the sea of people we had barely just been able to swim through to get there. We gathered with the Sisters and prayed over all the pain and suffering and asked for God’s guidance in the work before us. Then we began, washing, cleaning, and bandaging wounds of every kind. Father Rick, being a medical doctor, spent most of his time seeing children and diagnosing chronic diseases, malaria, malnutrition, tuberculosis, hepatitis, etc. The line to receive care is long and it takes a while, but eventually a man walks up with a very sick child and places him before us. This sick child’s name is Lucien. Father Rick’s face fills with concern upon seeing him. I immediately notice how skinny the child is and that he is non-responsive and close to death. We are too late perhaps. I see in Fr. Rick’s eyes a small glimmer of hope. A hope that is not rooted in science but rather in faith. As a doctor, he thought that Lucien wouldn’t make it, but as a priest, he knows that all things are possible through Christ. We got one of the Sisters to put in an IV, which in itself was a challenge as the dehydration was so severe that it seemed impossible to find a vein on Lucien. Father Rick told me to watch carefully the skill of the Sister. I was impressed not only by her skill inserting the needle in one of the veins on the child’s head but by her focus and compassion while she was doing it. She was devoted to God asking Him for His assistance, and towards Lucien, recognizing how every life is sacred. This is the same devotion I always see in the other Sisters while they spend their early hours in front of the Blessed Sacrament. Right after the baptism, Father Rick came back and handed papers over to Lucien’s father telling him that there is no time to waste and that he must run Lucien to St. Damien, but the man had no means of transportation and it would of taken hours before one of our ambulances could have come to pick them up. So Father Rick asked Father Hugo Esparza, a Passionist from Mexico who was visiting us, to accompany them to the hospital by motorbike. Imagine the scene on the motorbike. A driver, a father holding his sick child, and then almost falling off the back, a priest holding an IV back high above his head winding through roads full of holes, traffic, garbage, and dust. After sunset I returned to the ER, and as I walked in, the doctor gave me a nod and said, “He’s still alive”. I found Lucien in a bed that had opened up since his arrival. His father was next to the bed exhausted and asleep. I quietly touched Lucien’s right hand and he grabbed my finger almost as if he was saying to me, “no worries, I will hang on and I won’t let go”. A few days later when I returned to the emergency room to check on Lucien, I couldn’t find him. My first thought was that he had finally succumb and passed away during the night. And although this is typically how the story ends in this case, God had other plans. Lucien was moved to the malnutrition room. I found him upstairs this time with his mother next to him. He grabbed my finger again, “Still holding on”. Above the children’s bed are boards with each patients name and date of birth, Lucien: Dec 25th 2014. Born on Christmas day. Lucien, the boy who was saved both physically and spiritually by water, who had no bed in our ER upon arrival, whose very life is a miracle shares a birthday with Jesus. A few weeks passed by without seeing the father, so I asked about him and was told by Lucien’s mother that when he found out that Lucien was diagnosed with a chronic disease on top of the malnutrition, he disappeared. She almost did the same. 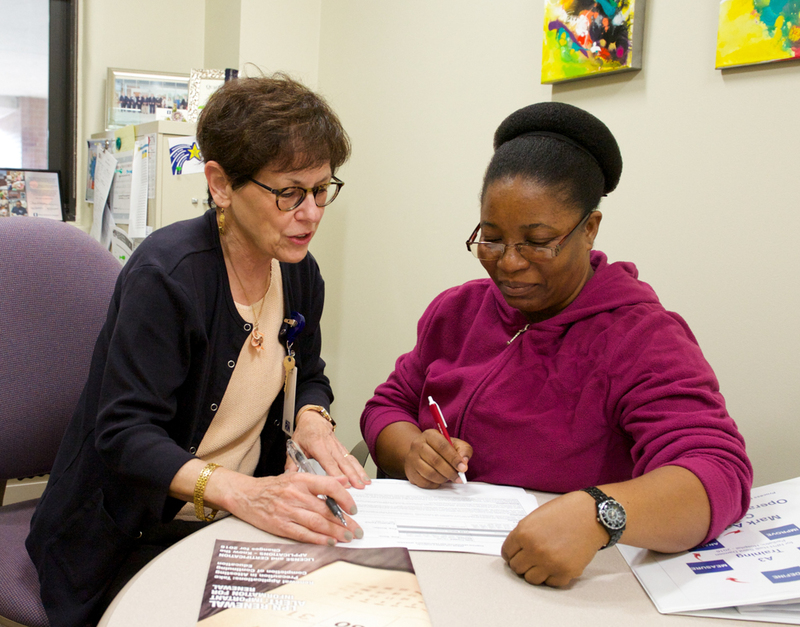 Our social service staff was able to convince her to stay and they placed her and Lucien in our follow up clinic. Still, they had nowhere to go to live. The father could not be contacted and Lucien’s grandmother (his mother’s mother) didn’t want to accept her daughter. In part because of the illness and also because she already cares for a four year old boy that her daughter conceived with another man in another similar situation. She was disappointed with her daughter and also considered Lucien as “a curse”. It seemed as the “no place for them in the inn” and the story was back again (cfr Luke 2:7). On October 28th, the feast of St. Jude apostle, together with the Missionaries of Charity, we decided to go visit the grandmother and try to convince her to accept her daughter and Lucien, by promising to provide food and possibly some kind of job to help sustain them. I sent requests to many of my friends at NPH requesting prayer and asking for the intercession of the Holy Family and of St. Jude, hoping the grandmother would understand like St. Joseph did in his dream (cfr Mt 1:20), that Lucien is not cursed at all, that he has no fault in all this and that he is actually blessed because God has already saved his life. We wanted her to see that Lucien is a blessing, and that his life is a miracle, and that God cares for him very much. On November 3th, Sr. Dominica, of the Missionaries of Charity, was able to meet Lucien’s grandmother who, after a long dialogue, accepted to welcome her daughter and grandson despite some financial and cultural issues. Lucien had improved so much in the last two months and now he is at home. Once a month, he and his mother will come to the hospital for follow up appointments with the clinic. We will also help the family by giving them a small business selling our chickens and tilapia fish produced by the St. Luke Foundation for Haiti. As you can see, your support is so important for us. Through it we are able to do outreach, to offer healthcare, education, water and food, and to help create jobs. All of these things allow people to live with dignity and change the trajectory of their lives. In total, Lucien spent 57 days at St. Damien. He is a very blessed boy and I wish to express together with Fr. Rick and Lucien’s mother our gratitude for your prayers. Thank you all and please continue to pray for Lucien and his family, but especially for the so many other children and women, like Lucien and his mother, who are struggling to survive and searching for an extended hand or finger to hold on to. God bless you all and may we always make space in our hearts to welcome the child Jesus. Fr. Enzo Del Brocco, C.P. With Gratitude, What We Accomplished With Your Help! Sixth anniversary of the Haiti earthquake. This Tuesday, January 12, marks the sixth anniversary of the 7.0-magnitude earthquake that devastated the nation of Haiti. Fr. Rick Frechette, National Director of NPH Haiti, reports that, “even though the country is still bouncing back from the devastation, the team at St. Damien is tireless in its efforts to help the most vulnerable. Because of our successful and unique approach to healthcare, we are able to reach the children and families that need us most. Cholera is still present after six long years, and our pediatric beds are always full, especially when it rains. Delivered 2,000 babies and provided neonatology care for 480 babies. 21 children received life-saving cardiac surgery – a new program at St. Damien this past year. Treated over 3,000 children for dehydration with an average of 50 children diagnosed with cholera monthly. Provided over 1,700 Tuberculosis consults and treated 267 new cases. Over 800 Oncology consults with 67 new children receiving cancer treatment. We are deeply grateful to everyone who supported St. Damien in 2015 by making donations, attending events, visiting, volunteering, and giving products and services. With your help we will continue to support thousands of children who need us. Ruth and her mother at St. Damien Hospital. As we celebrate with joy the season of Christmas, and are delighted to be given gifts in beautiful wrappings, in truth the biggest gift we can possibly receive is witnessing how God is working all around us, to make a wrong world right. The bible speaks of the birth of Christ as the end of the reign of darkness, as a time of mercy and forgiveness, as a time when the lion and the lamb will live together in peace. This new age of blessing will be ushered in by a tiny child. While working as a doctor last Saturday with Mother Teresa’s Sisters in their clinic, in downtown Port au Prince, I mustered up my strength for the usual array of terrible wounds, advanced illnesses, and harsh sufferings of these very poor people. Late in the morning, when the last people to be consulted were coming into view, I caught sight of a 5-year-old girl who was remarkable for her wide open gaze. From a distance, she made me chuckle, as her expression made her seem so curious and bright. Her name is Ruth*. But when Ruth was finally in front of me, it was a different story. I noticed that her wide opened eyes were fixed on me, but she could only barely see me. Her eyes did not move freely, rather she turned her whole head to try to look at something. I suspected deficiency of vitamin A, which often causes this loss of vision and then total blindness. Looking at her closely, she had signs of other vitamin deficiencies as well. For sure, because of where and how she lives, she was also host to parasites and amoebas that robbed her of nutrition, and that her depressed immune system made it likely she has tuberculosis. Her illness is of human making. She is sick because of unfairness, because of social and economic unfairness. Poverty is of our making, not of God’s making. Her uneducated parents cannot find work, and so good food, clean water and seeing a doctor when you are sick, are all impossible luxuries. When you live among the poorest of people, in filthy and crowded slums, the door to life closes tight against you, and marks you with the stigma of poverty. In trying to help Ruth, treating the parasites was the only easy part. For complex reasons related to her family, Ruth could not be admitted to our St. Damien Hospital. Yet she still urgently needs injections of vitamin A, and now this would be an enormous challenge. So would be her treatment of tuberculosis. I slipped into sadness as I considered that even if we are able to give Ruth all the right medicines, we cannot change the economic circumstances of her life, of her poverty, which is finally the cause of her illness. As I looked for solutions to the deeper layers of Ruth’s problems, I felt like someone trying to untie a massive knot in a string, yet never quite finding the loose end, from which to begin the untying. Ruth’s life is tragic, and trying to unravel what is wrong reveals even more levels of wrongness. The Christmas message is just this: it is God himself who chooses to enter into every level of these tragedies, in order to work salvation. God wants Ruth’s eyes to see. To see her mom again. And I pledge by the holiness of Christmas that we at NPH Haiti will find every way to make this happen. I hope that Ruth will come to the outpatient clinic at our St. Damien Pediatric Hospital for folllow-up for her TB and vitamin A injections, though this depends on her mother. The very last person to see for the day was Madame Moise. She is, amazingly when you think of the poverty in which she lives, a glowing and gracious woman of 79 years. I had seen Madame Moise just a few weeks before. She came because she also was nearly blind. A quick flash of my penlight across her eyes showed thick cataracts. I had sent her to a friend in town, an eye doctor, to have the cataracts removed. It isn’t really thanks to me. Alright, maybe it is a little bit. This is my Christmas gift to you, introducing you to these two amazing Haitian women. One is very young and the other very old. For both, because of their poverty, their best shot at healthcare was in a crowded clinic, in the market at Croix des Bossales, in Port au Prince. They shine like two diamonds against the dark background of poverty. They have fallen into my hands, and by extension, into yours. Who can miss what is happening here, and how God is working wonders through us? Thank you for your faithful help to all of us at NPH, in all the countries where we work, for all the children in our homes, and those who come to us for help. Merry Christmas and God bless you and your families in the new year! 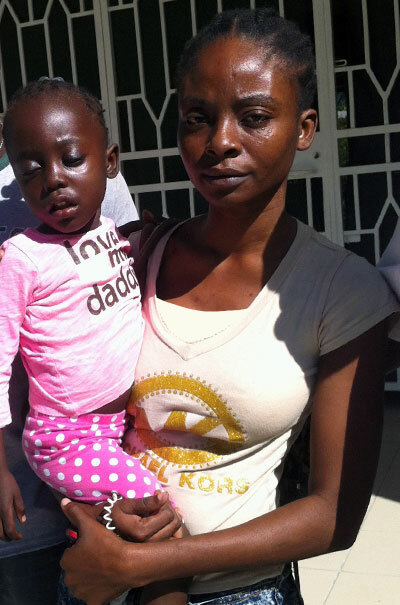 We are happy to report that since the time of this writing, Ruth’s mother has brought her to the NPH Haiti St. Damien Hospital for outpatient treatment for TB and for vitamin A injections.